Property Flyers, Estate Agent Leaflets, call them what you want – here at Designers Up North we are renowned for our ability to produce effective property marketing flyers that generate results. A simple search on Google throws up a whole host of companies offering ‘pre-designed’ property flyers that, whilst being extremely cost effective, have been used, and re-used, by Estate Agents countrywide. It’s even possible your competitors have used the very same service. Hardly the best way of selling your unique Estate Agent services to potential buyers. 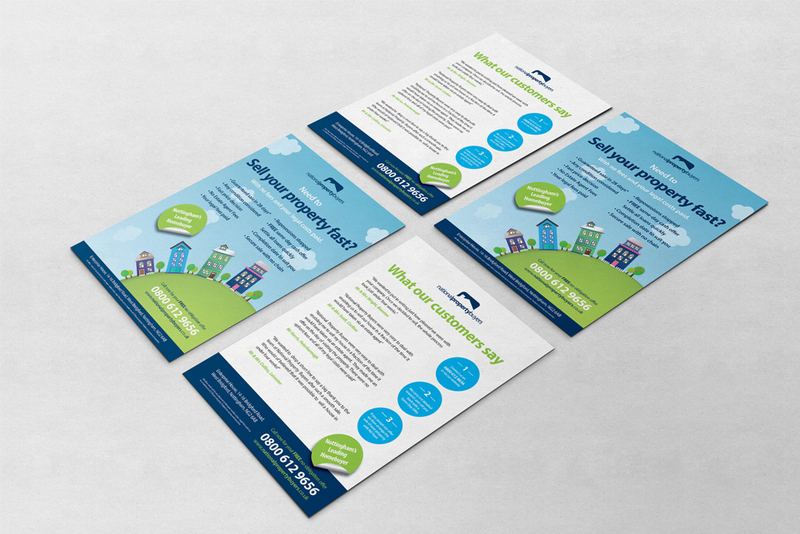 Estate Agent Leaflet Design – Just for your company. We design each and every property flyer from scratch – no templates, no re-hashed concepts, we analyse your business, your competitors and create a leaflet design that will be effective. We can arrange the printing and delivery, choose the stock it will be printed on, and even create window posters, press adverts and website banners from the same concept to give you an all out marketing campaign. 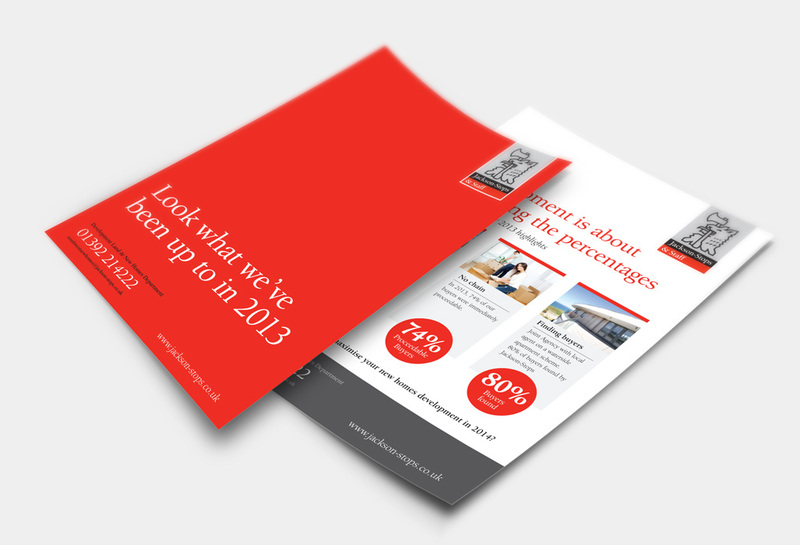 Getting more value from your leaflet can only be a good thing. 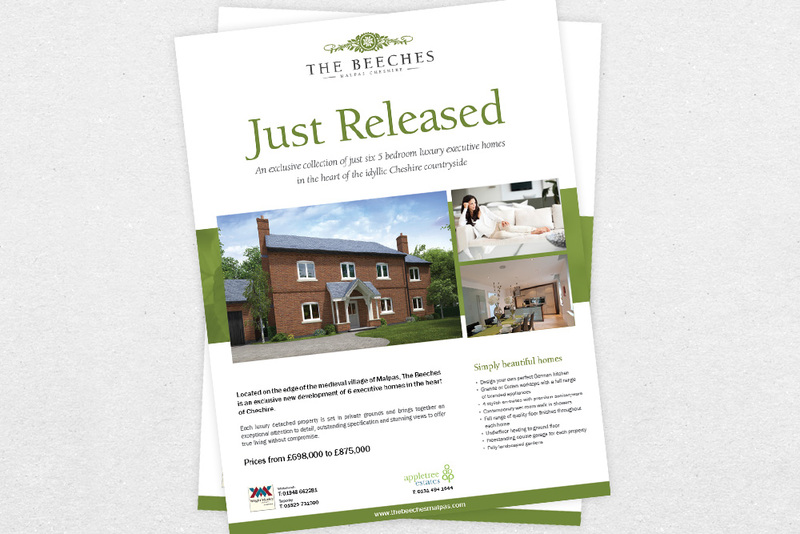 We took a property leaflet design and made it into a full page advert design too. 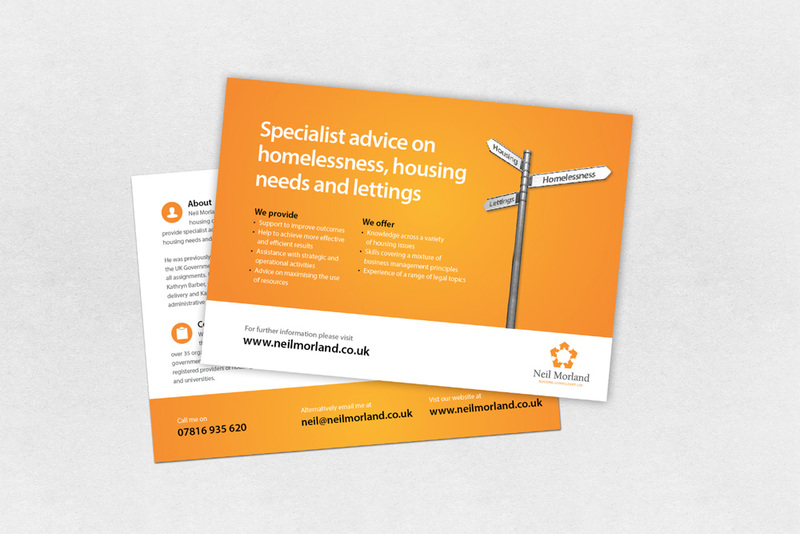 For one design fee, this client ran a newspaper advertising campaign alongside a digital and leaflet based approach. 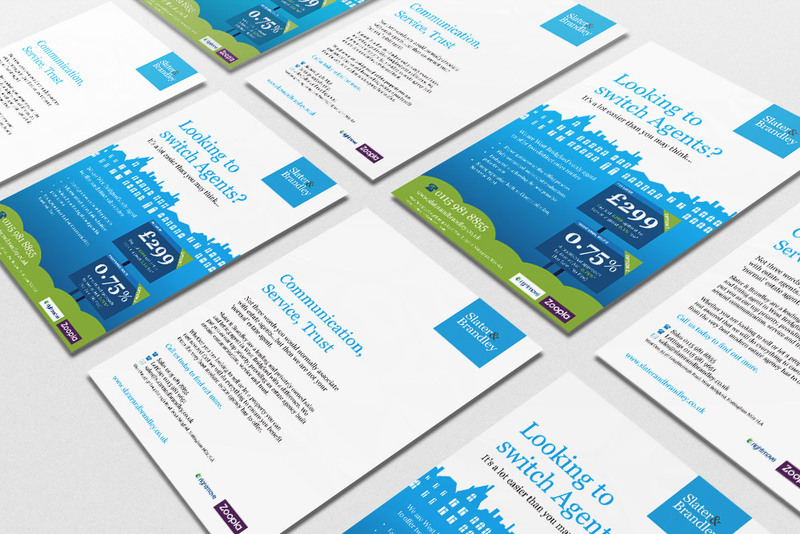 Slater & Brandley are one of Nottingham’s leading independent Estate Agents and wanted an estate agent leaflet design that stood out from their competition. After research we found that 99% of their competition were using standard stock images and cheap templates from low cost online producers. A dedicated design to enhance their brand ensured great results and enquiries are still coming in many weeks later. As one of the UK’s leading Estate Agents, Jackson Stops & Staff have a strict style guide and brand to adhere to. We have been working for them for many years and continue to produce fresh and innovative marketing campaigns to ensure they stay ahead of the game. 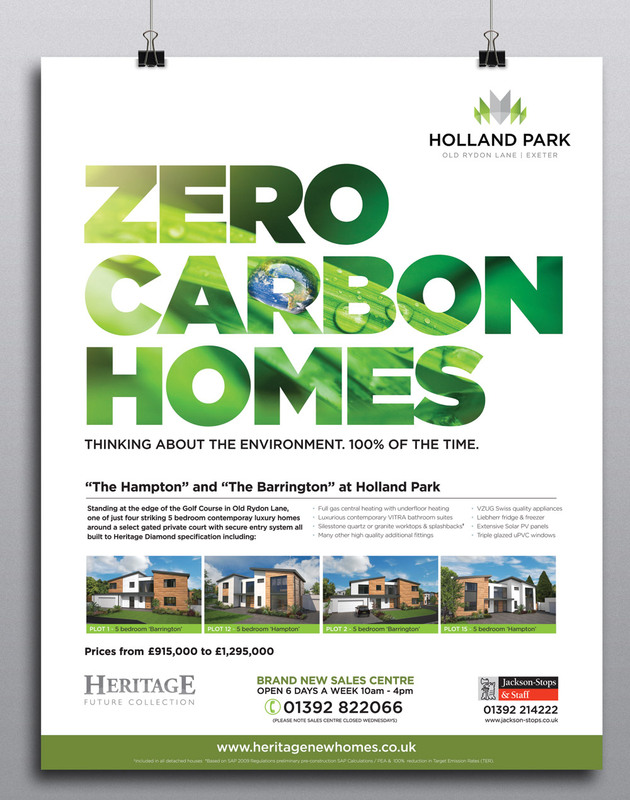 Set as a multi-purpose design, we created this for use as a leaflet, and a full page property advert. With Zero Carbon Homes being the focus, potential buyers warmed to the fact that they were helping the environment and potentially saving money on their household utility bills. Phase One of Holland Park sold in record time and we are now helping market Phase Two and preparing for the third phase of this award winning development. 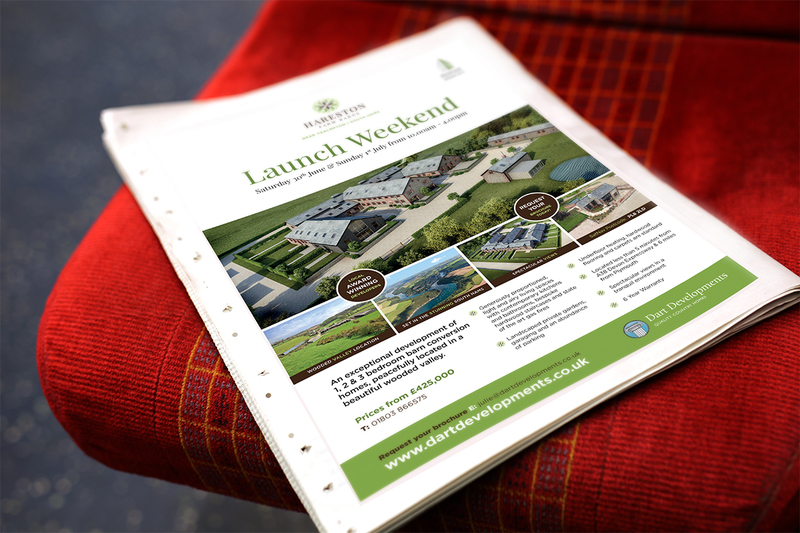 When a developer or estate agent wants to let potential buyers know about a new development it is often the leaflet design that proves more cost effective. Property brochures cost a lot of money, and giving those out at ten-a-penny is often futile unless you are handing them on to buyers that are targeted. The simple leaflet is a great way of advertising the development by leaving them in Estate Agent offices, Sales Offices and hot spots. 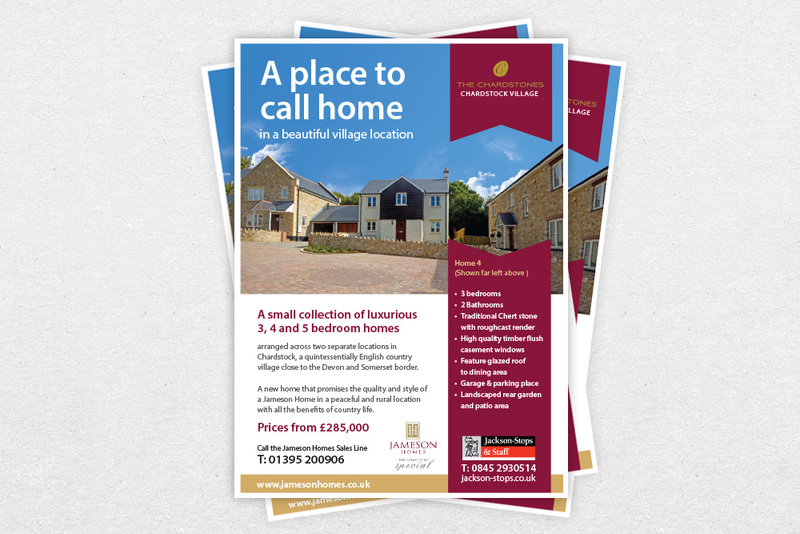 Jameson Homes not only sold a large detached home from this property flyer design, they also saved money by re-using it as a quarter page property advert in their local press. To save money, and gain a sale, proves the effectiveness of this simple format. 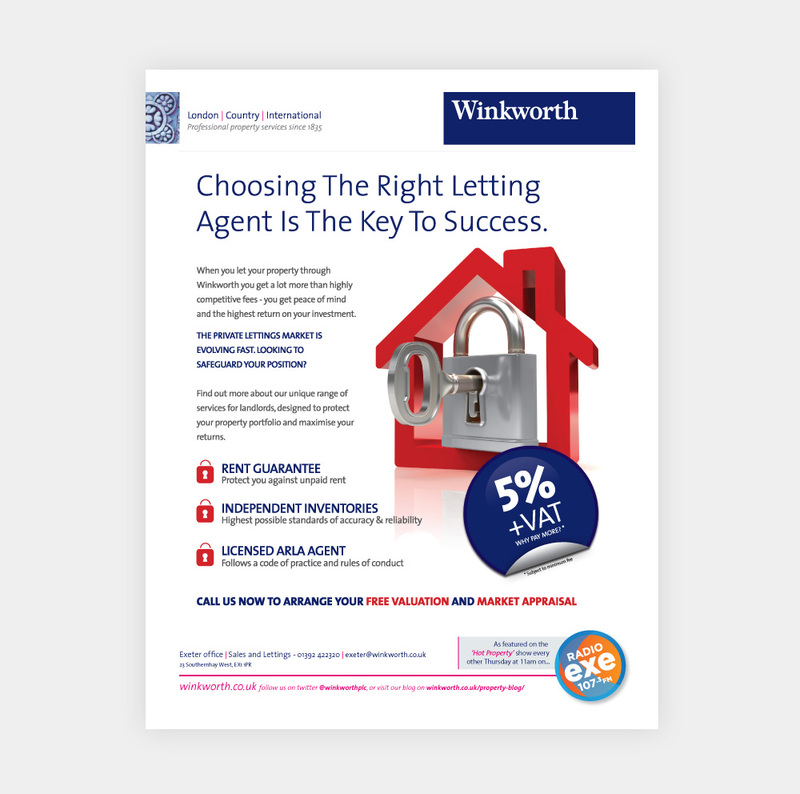 Winkworth Estate Agents are a national estate agent with a distinct style guide for their advertising. Following the company guidelines, Designers Up North created this clean design advertising their letting services.